First of the autumn Street-O events in Burn Bridge was held in daylight (well almost), the results are now available – have a look at the events page here. Come and have a go at the next one on 6th October – by then head-torches will be a good idea! 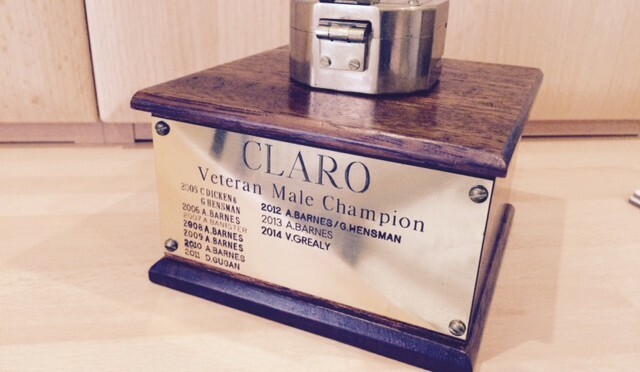 Sunday saw a reasonable turnout and some excellent weather for CLARO’s first event of the new season. Everything seemed to go well for our first event of the new season. The weather was far better than expected or forecast, and the majority certainly seemed to enjoy themselves. There were a few comments about how physical the courses were, but the planner made the best of the terrain available. My thanks to the usual suspects – Mark as planner and Graham as controller, the CLARO helper teams, Alastair Harvey from Yorkshire Water and the British Canoe Union for the use of their facilities. There were two items found in the assembly area: an Army issue green towel and a reasonably old pair of sunglasses. Contact me if you wish to claim them. Hanging Moor was a beautiful place to be today, chiefly due to the glorious weather. 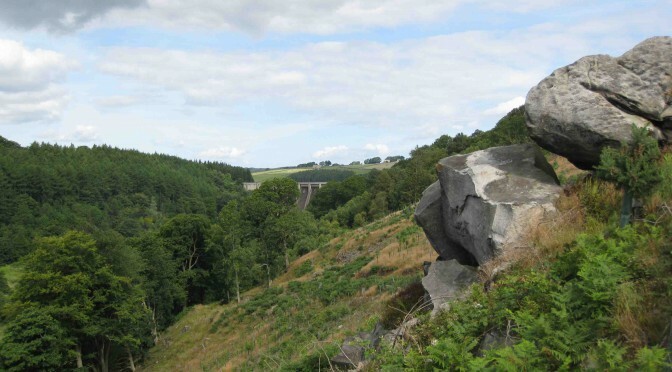 The terrain varies between lovely runnable paths and moorland to steep and rough slopes with plenty of vegetation. There was always going to be a tricky ascent for all courses through the felled slope at the beginning. I think Mark did a great job in getting the courses through this without too much difficulty for competitors. The other area that competitors seemed to struggle with was the woodland inside the deer fencing; although the map could do with some improvement in this area, it was generally a lovely bit of wood and was well worth using. Details are now up for the new Club League. As usual, about 15-20 events are selected from local or regional fixtures all within about an hour of Harrogate, excluding urban and night events. This year there are some new areas and one or two from clubs outside YHOA. There are also a few Level B events which require pre-entry online and have closing dates, so check them out and don’t miss out if you want to go. Good luck! Prizes for this year’s league will be awarded at the AGM. If you currently have a trophy please bring it to Hanging Moor or contact Vince to arrange return. Details are now available for our first event of the new season at Hanging Moor on Sunday 13th September 2015. Planning is going well and we are looking forward to a good day out. Full details are here. Hope to see you there. Welcome to the Claro Harrogate Schools Orienteering League. The League is new for 2015 and is open to all children and young people from Harrogate, Knaresborough, Ripon and Nidderdale, although anyone can take part in the events. If you need lots of copies please get in touch and we can send you some. The Claro Harrogate Schools Orienteering League is run by Claro Orienteering Club in partnership with Harrogate School Sports Partnership. The aim is to provide participants with the opportunity to learn and develop self confidence, decision making and map reading skills while improving their fitness in a fun, competitive and challenging outdoor sport environment. The League runs from November to May. There will be 6 events between Autumn and late Spring – no event in March because of the big JK Festival. All events will be on a Saturday afternoon in urban parks or woodland in or near Harrogate. Events will be open to all, but the league only has categories for children and young people from Y4 to Y10. There will be individual competitions (male and female) for each year group and two schools competitions, one for Primary and one for Secondary, for schools covered by the Harrogate Schools Sports Partnership. There will also be a (light-hearted!) parent’s competition. From 2pm to 3pm. Participants complete an entry form and receive a map with the course and an electronic chip to record their times. There will be help available to show newcomers what to do. From 2.30pm to 3.30pm. Participants start at 1 minute intervals. Please note that courses close at 4.30pm and control points will start to be collected from this time so it is important that people start with enough time to complete their course. Inexperienced participants should arrive early so they can take the earlier start slots. All participants should enter as individuals, but they are welcome to run with a friend. However, both must register separately and the time for each runner will count, even if they stick together throughout the course. It is not necessary for the school to enter participants . Individual entry on the day to cover costs. This includes the hire of an electronic timing chip (or “dibber”). Individuals can have a second run for £1 (discounted 50p) but only the first run counts for the League. Schools are not required to pay any fees to enter the League. No specialist equipment is needed for beginners. Wear suitable footwear for running on rough ground and clothing appropriate to being outside whatever the weather – preferably clothes that you don’t mind getting muddy. The electronic timing chips (dibbers) are loaned to participants as part of the entry fee for each event. Please take care to secure these carefully to fingers using the loop as they are small, expensive items and losses will be charged for. Participants on Orange courses may want to use a compass, which can also be borrowed at registration if necessary. 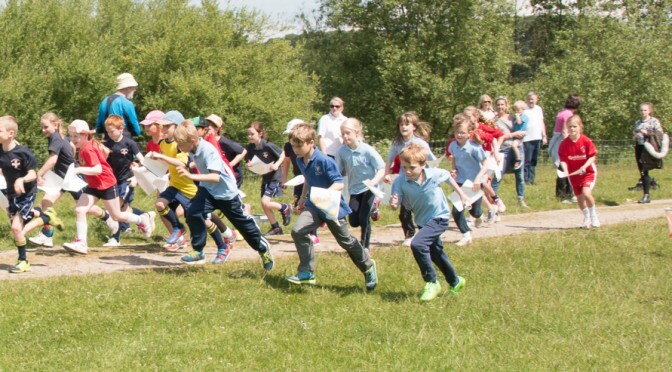 Y4 and Y5 will compete on the White course; normally between 1 and 1.5 km. Y6 will compete on the Yellow Course normally between 1.5 and 2.5 km. Both courses will involve straightforward navigation and are designed so that they can be completed without the use of a compass. Children can expect to take between 10 and 40 minutes to complete the White course; between 20 and 40 minutes on the Yellow course. Whilst Y4 is the youngest competition age category, Y3s or younger may take part with Y4s. Y7s will compete on the Yellow course, alongside Y6s. Y8 and Y9 will compete on the Orange course and Y10 and above will compete on the Long Orange course. The Orange course is around 2.5km in length and the Long Orange course is around 3.5km. Both provide a greater navigational challenge. Skilled navigators can risk taking shorter routes away from paths and line features while there will usually be easier, safer but longer routes between controls. Very skilled juniors might complete the course in just over 30 minutes while inexperienced participants can expect to take an hour or more. Inexperienced participants should therefore arrive early so they can take the earlier start slots. A compass, and knowing how to use one, is recommended. Youngsters tackling the Orange or Long Orange course with no previous experience of orienteering will find it challenging, and should be prepared to be patient as they develop their skills. Assistance out on the Course. Parents, guardians etc are encouraged to accompany beginners on the course. In orienteering this is called “shadowing”. This is different to an adult competing as the adult will have a map but not a timing chip. Anyone shadowing a participant should avoid ‘doing it themselves’ with the participant in tow in an attempt to get the participant a fast time. This achieves nothing as the participant gets no sense of achievement and learns very little. Instead, shadowers should stay back and allow the participant to do all the navigation themselves if possible, and only help out where a mistake has been made or the participant asks for help. Orienteering is renowned as a family participation sport and other family members are welcome to take part. Adults may run any course on offer, and there will be a parent’s competition which will use a handicap system to allow for degree of course difficulty. Parents should not compete if they have already been around the course shadowing. Seriously lost children are a rarity in orienteering. However, anyone getting disorientated should not wander about aimlessly. Instead, get on to the nearest track or path and remain where you are and you will be found! If you see a control marker not on your course, remain with it and ask another passing competitor for help. Carrying a whistle is recommended. Courses will never cross or use public roads. Each participant is given a hired electronic timing chip (commonly called a “dibber”) at registration (included in entry). This is used to record the time taken and to show that each control point has been visited. The chip is downloaded to a computer back at registration after completion of the course. Points will be awarded depending on finish position, with the winner in each year category scoring 100, 2nd scoring 99 etc. The league table will be updated after each event. An individual’s best 3 results will count to their overall standing. Prizes will also be awarded to individual boy and girl winners in each year from Y4 to Y10. The School Team competitions will be decided by adding a school’s best 4 scores per event from the individual results. Results will be published on the Claro website (www.claro-orienteering.org.uk) by the Sunday after each event, along with detailed ’split times’ for each runner showing the time taken to each control. This makes it possible to work out how much time you might have lost through either getting lost or making a bad route choice. As part of these events, a CLARO coach will run a series of free sessions designed to introduce orienteering and explain techniques to newcomers and those wishing to know more. Each session will be designed to end in enough time for participants to go off on a course and use what they have just learned.